Firstly: People ask me how I do all I do all the time. I've posted about it before, but continue to think about the subject and have come to this conclusion: I don't thrift/garage sale/antique [which are not really verbs, but it made for a succinct phrase which I've now negated with my commentary]. Perhaps when I can just run out of the house without diapers, snacks, and children I may find that searching for something I didn't know existed might fall into my routine of life, but right now it doesn't. So, most likely when you see something like this "vintage" milk bottle in my house, it's probably not really vintage at all. Which means you can have one too! If you have never heard of Fishs Eddy, you will discover a void that you didn't know needed filling. It's one of those places where I almost want one of everything. If you're in New York, make a stop there. If you're not, click here. Secondly: One of my most favorite candies in the whole world [which says mucho because I love candy] was brought to me by my mom when they came to visit. Startups Perfume Candy. aka Magnolias. Each little crunchy shell contains a drop of perfumed liquid. Guess where they're made. You won't so I'll tell you: Provo, Utah. Thirdly: I received Grandma Fae's Lemon Custard Chandelier Star for my birthday. It's already hanging up on my chandelier, and it makes me smile. Things that make one smile are always good. Smiling is good. You can have one too with a 20% rebate [on any of the stars] good until tomorrow--the last day of July--just mention no big dill in comments to seller. So. What are your good things that I need to know about? Love love Fishs Eddy - I have their Polka Dot Handled Cups and absolutely love them (we mostly use them for soup). They make me smile every time! ah! depressed! you must keep up the giveaways until i get my paws on some beaded goodness. our garage is filled with our family's things... so i just go down and thrift there. last week i got a new make up bag and a mirrored jewelry tray. i'll have to check out Fishs(?) Eddy, sounds intriguing. I feel so honored that you mentioned my comment as an actual post. And you are right I do NEED multiple things from this Fishs Eddy! That must be where you got those great hands (headband holders). And yes I have been looking for those at my thrift stores too! I have never tried the perfume candies. They look yummy! Also I love Grandma's star. I'm so glad you have it. Love you! What a delightfully good things! 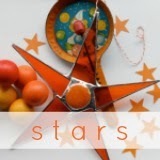 I do have a couple of your Dad's stars hanging in my sun room and I LOVE them!! Fun! I would have guessed where Startups is...I drive by it almost every day. Its a great place for candy.